I don’t recall there being a whole lot of art around the house when I was a kid but there was one small - and I mean really small - print that was mounted on a block of wood and hung up in the kitchen. It’s exact dimensions in fact are two inches by four inches and I know this because I measured it myself when, a year or so back, my mother hunted it down for me and mailed it to me. She had even forgotten it existed and it took her so long to find, she thought she may have thrown it away. Now it’s safely here with me, it’s taken on a whole new life. Mothers ask the best questions, don’t you think? For once I knew the answer. Somewhere in between me not even being able to reach it on the wall and now, I discovered that it was a tiny print of a piece by Arthur Rackham. Inquisitive as ever, I began to hunt down his work - which in a pre-internet world is not quite as simple as it sounds, believe me - but I fell in love with what he could do and he became one of my heroes, but what is it that he created that caused such a chemical reaction? I know I’m not the only one who feels this way. 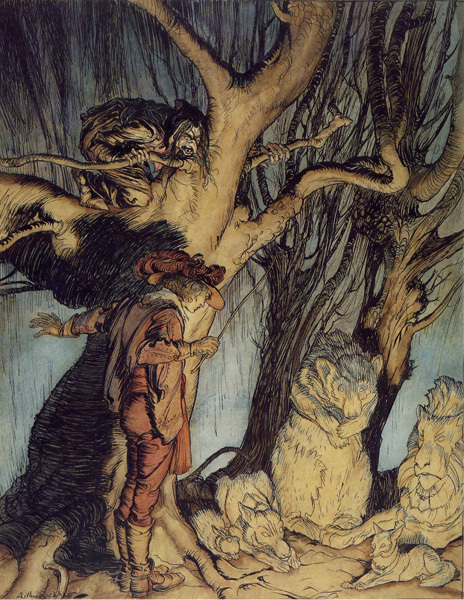 There is very little in the way of biographical information about Rackham in the world but it appears that from a very early age he was enamoured with the Brothers Grimm. 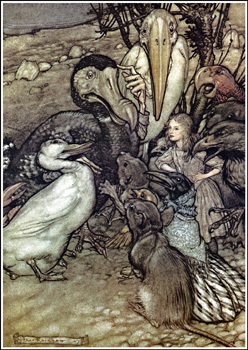 Born in 1867 (and died in 1939) his astonishing output began with illustrations of a special edition of the Grimm tales. So far as I can make out, he met the painter Edith Starkie over a garden fence. They eventually married and it was she who pushed him to break with traditional practices and develop his own style. The first edition of this (around 1909) was violent - grim even - but during the final year of the first World War, he came back to the project this time delivering illustrations that were intended to buoy the human spirit among the darkness… these works were off the scale beautiful, charming and contained all the hallmarks of what was to come. He is probably most famous however for his work on Alice In Wonderland for which provided a template no future collaborator on the work could ever escape. It was too defining, too great to ever break away from and aside from being iconic in its own right, he also created a new business model for the publishing industry. His books were published as special editions in small limited runs. They were lavish, signed and expensive and were meant to provide a superior alternative to the mass market editions that appeared at the same time. Ironically perhaps, they were in such high demand that the limited editions were all people wanted, leaving the mass market edition lying in the dust. (There’s a lesson here somewhere for any artist who thinks going down the ‘affordable’ route is the best way to put food on the table). In the first piece of this series, I suggested that Rackham’s work was influenced by Henry Justice Ford - and it was - but he put so much of his own mind into what followed across the years that the distance by the end of their careers was a chasm. 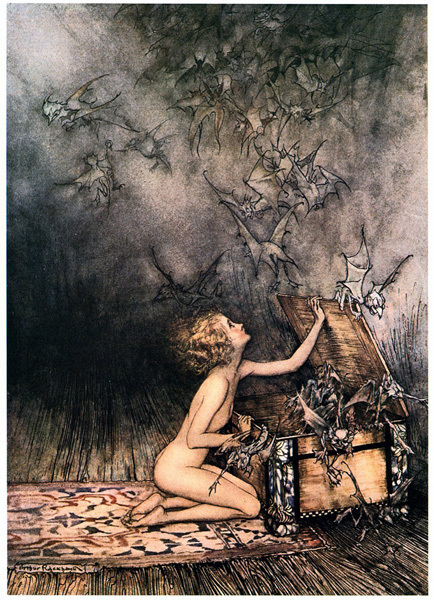 For me, Arthur Rackham is the King of Illustration and so far, nobody has been able to shake off his influence. Scraps of the things he saw behind the curtains are everywhere. Guillermo Del Toro (who we will come to at the end of this series) has often cited Rackham as a big influence on the design of the Faun in Pan’s Labyrinth - and you’ll also find the design of the tree (in Hellboy) that sprouts from the altar where Hellboy was brought over, is described by Del Toro as ‘The Rackham Tree’. But sweep all of this aside and form a relationship of your own with Rackham and all kinds of magic will begin to happen. It’s right here that faeries begin to exist for real. It’s here that trees are able to take on human attributes and interact with us at a level we understand, it’s here that at the bottom of the garden pixies go to war with spiders over territory. The world in not so simple as we would like to make out. 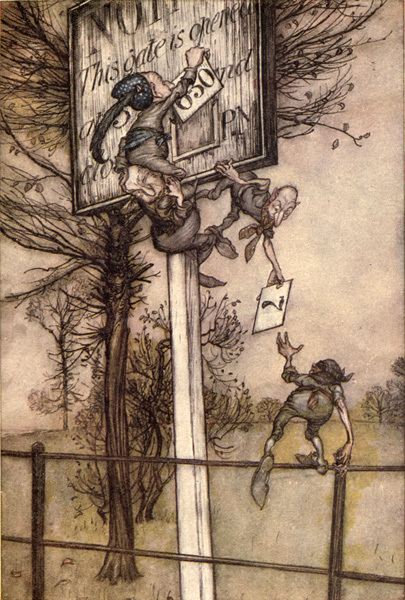 Arthur Rackham single-handedly built a bridge between one world and another. For some of us, that bridge still exists. Theres no toll-booth. No gate-keeper. No traffic. Whenever you need that bridge, it’s right there for you. There are always trolls beneath it, but it’s always right where you left it. If you can leave a similar legacy behind for future generations to fall back on - in whatever it is you do - I would say you’re doing something very right. Footnote: That little print my mother gave me? 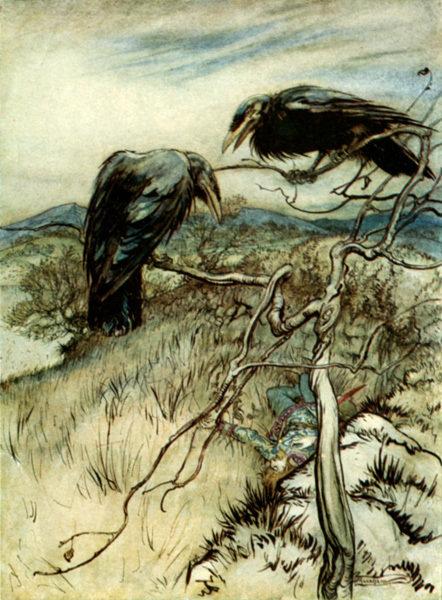 It was called (as is the poem it illustrates) The Twa Corbies (which is ancient Scottish for ‘The Two Crows’) and until I got my hands on a much bigger version that revealed some detail, I didn’t know the whole story. So far as I was concerned it was two crows hanging out at the top of a tree but this is far from the whole truth. What they are really doing is looking down upon a man with long hair, unshaven face, blue pants and a pair of brown boots who is lying - apparently in dream - in the grass. A read through the poem however will tell you that he is a knight who has died, his dog has run off in pursuit of other play, his pregnant lover is in the arms of another man and the two birds are simply discussing their lunch. Life sure has a weird way of imitating art when you take the time to look closely at what the world is trying to tell you. SIÔN SMITH (PRONOUNCED SEAN AS IN CONNERY) IS A WRITER WHO DISLIKES WRITING IN THE THIRD PERSON SO MUCH, I'M NOT GOING TO DO IT ANYMORE. I WRITE LONGHAND WITH A WATERMAN BECAUSE THE ALTERNATIVE IS JUST TYPING. I WAS ONCE DESCRIBED AS 'BYRONESQUE' WHICH MAY BE THE NICEST THING ANYBODY EVER SAID ABOUT ME. I BEGAN GROWN UP LIFE PUTTING IN TEN YEARS AS A SINGER/SONGWRITER. I THEN WENT ON TO CREATE AND EDIT BURN MAGAZINE AND ZERO MAGAZINE (A COUPLE OF ROCK MUSIC MAGAZINES) AND RIGHT NOW, AM THE EDITOR OF SKIN DEEP TATTOO MAGAZINE… WHICH IS HOW I COME TO BE PLAYING IN MR HERMAN’S SANDPIT. I HAVE A THING FOR BOOKS, OLD MONSTER MOVIES AND THE RAIN. I LIKE SAMURAI WAYS, ART, AIRPORTS, COFFEE AND SAVING BEARS. I OWN ONLY TWELVE THINGS BECAUSE YOU SHOULD NEVER OWN SO MUCH THAT YOU CAN'T LEAVE TOWN WITH YOUR WORLD IN THE CAR.